How long will food last without power? I’ve already blogged about this here, but I wanted to include a good link to foodsafety.gov with specific information on how long various foods last in the refrigerator during an emergency. The short answers is that food will last 4 hours without electricity if you keep the door to the refrigerator closed. Once meats and protein foods are kept at over 40 degrees F for more than 2 hours, you need to throw them out. This is because these foods have a pH of 7 or so, and bacteria can have quite a celebration when these foods reach room temperature — which is the temperature at which bacteria thrive. Save the peanut butter and canned foods for last and consume meat, eggs, and milk first. If you haven’t lost electricity yet, GET MEATS INTO THE FREEZER SO YOU CAN BUY YOURSELF A LITTLE EXTRA TIME! See those shriveled little guys in the cup? They’re cheap, and they turn into those plump, delicious beans still steaming in the glass container. This is so easy you’ll be amazed you never thought of it before. After that you’ll taste freshly made beans and only keep canned for the times you forget to soak some in advance (which, shamefully, is quite often for me). All you need to cook beans is a pot, a mixing bowl, beans of choice, water and a dash of oil. Some beans, like black eyed peas (beans) and adzuki beans, don’t need soaking. 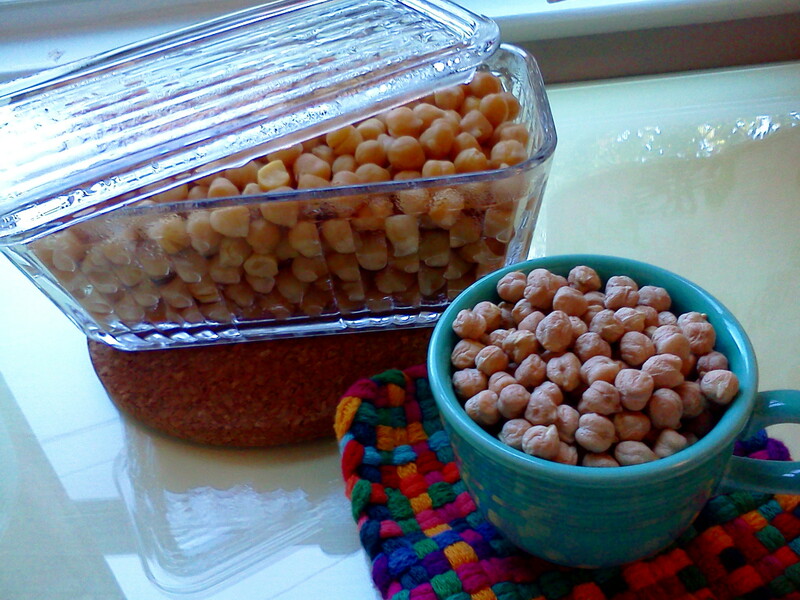 Today I made garbanzos, so I’m going to use those as the example. I’ve been doing a lot of running around lately, and I have a tendency when out and about to look around at the prices for the things we buy a lot. Like food. Although I can barely remember to pick up dog food before we run out, or to make my kid’s dental appointment, I have a decent memory for prices because I’m genetically engineered to avoid being ripped off. Today I made my monthly (bi-monthly?) trip to Ralph’s (Kroger). Let me first say that Ralph’s, you have a LOT of nerve saying you have low prices. Most of the foods in the store were not just priced a little higher, but a LOT higher. We’re talking a buck or more in some cases. Of course, I’m not talking about the foods I was there to buy: Pad Thai noodles, sliced water chestnuts, and ginger (which, at the same price as Trader Joe’s, is refrigerated and of much higher quality/freshness). In fairness, on my way out I spotted organic chard for the same price as at Whole Foods ($1.99 a bunch) and organic carrots for $.79 a pound and made off with both on impulse (whoo, I really like to live big, don’t I?). Clearly Ralph’s does all right on some items (grapes, for example, were competitively priced on sale, as were apples), and makes up a lot of ground on others (you can get spanked buying detergent there, and the pasta was at least $.20 more per bag). Beans in bulk at Whole Foods cost less per pound than conventionally grown dry beans at Ralph’s. That’s how dynamic pricing works: They grab you for the sale, and grab you somewhere down south for the rest. I was particularly peeved by the price of Fage yogurt. Mmmm. 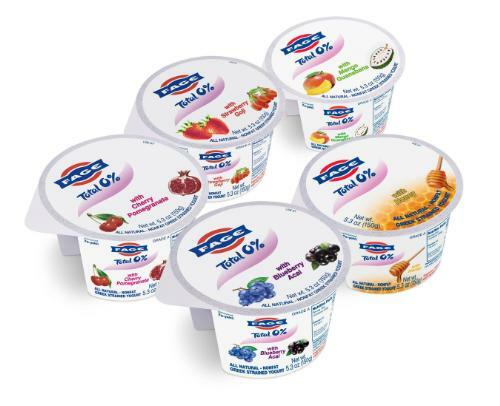 How much are you willing to pay to get your yogurt fix?